ThemeXpert has a surprise present for the month of September, 2011. It's a free premium template named Freemium! It utilizes the full power of Expose including cross-browser compatibility, built-in mobile device compatibility, brilliant typography, all the cool and strong plug-ins, light weight code etc. 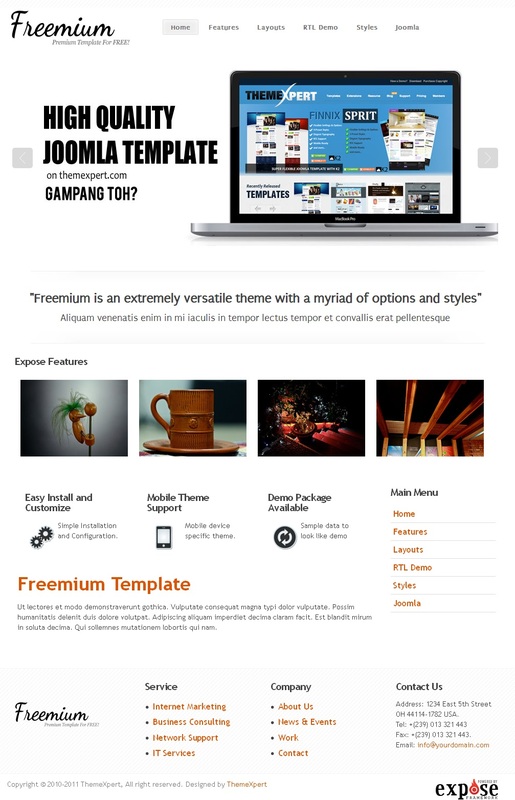 The main attraction of Freemium is that its charming design and simply elegant structure. This exclusive feature makes it suitable for any type of website. And the surprise doesn't end here, Freemium utilize CSS3 animation on this template. It has super cool effects on menu, text color, link color etc. So all in all, the members of ThemeXpert community are sure to be amazed by this effort from the experts with the awesomeness of Freemium.